Glowing brightly about 160 000 light-years away, the Tarantula Nebula is the most spectacular feature of the Large Magellanic Cloud, a satellite galaxy to our Milky Way. The VLT Survey Telescope at ESO’s Paranal Observatory in Chile has imaged this region and its rich surroundings in exquisite detail. It reveals a cosmic landscape of star clusters, glowing gas clouds and the scattered remains of supernova explosions. This is the sharpest image ever of this entire field. 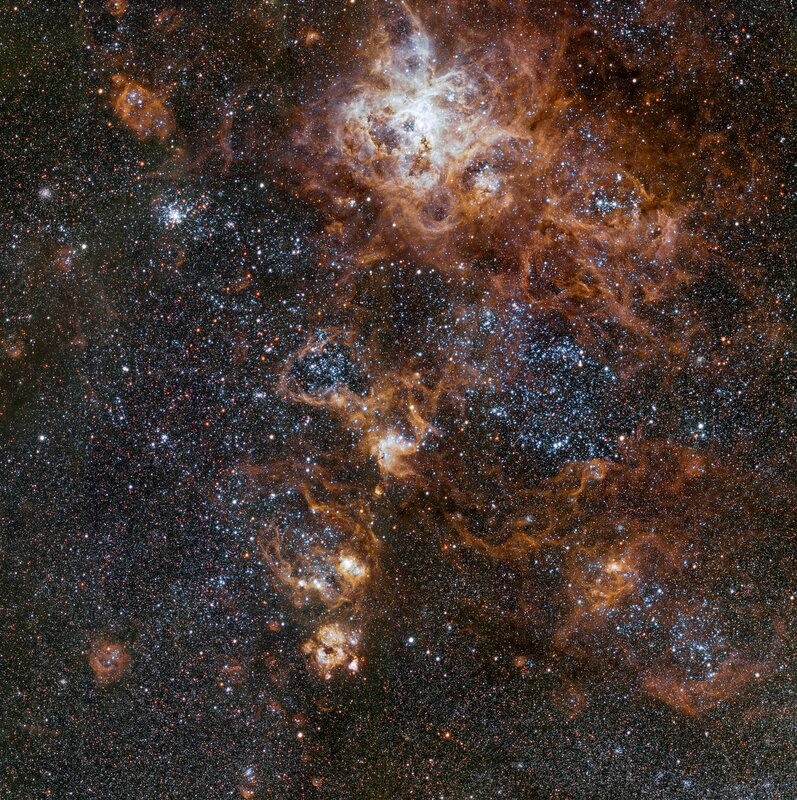 Taking advantage of the capacities of the VLT Survey Telescope (VST) at ESO’s Paranal Observatory in Chile, astronomers captured this very detailed new image of the Tarantula Nebula and its numerous neighbouring nebulae and star clusters. The Tarantula, which is also known as 30 Doradus, is the brightest and most energetic star-forming region in the Local Group of galaxies. 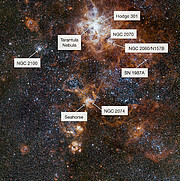 The Tarantula Nebula, at the top of this image, spans more than 1000 light-years and is located in the constellation of Dorado (The Dolphinfish) in the far southern sky. This stunning nebula is part of the Large Magellanic Cloud, a dwarf galaxy that measures about 14 000 light-years across. The Large Magellanic Cloud is one of the closest galaxies to the Milky Way. At the core of the Tarantula Nebula lies a young, giant star cluster called NGC 2070, a starburst region whose dense core, R136, contains some of the most massive and luminous stars known. 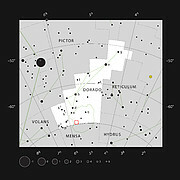 The bright glow of the Tarantula Nebula itself was first recorded by French astronomer Nicolas-Louis de Lacaille in 1751. 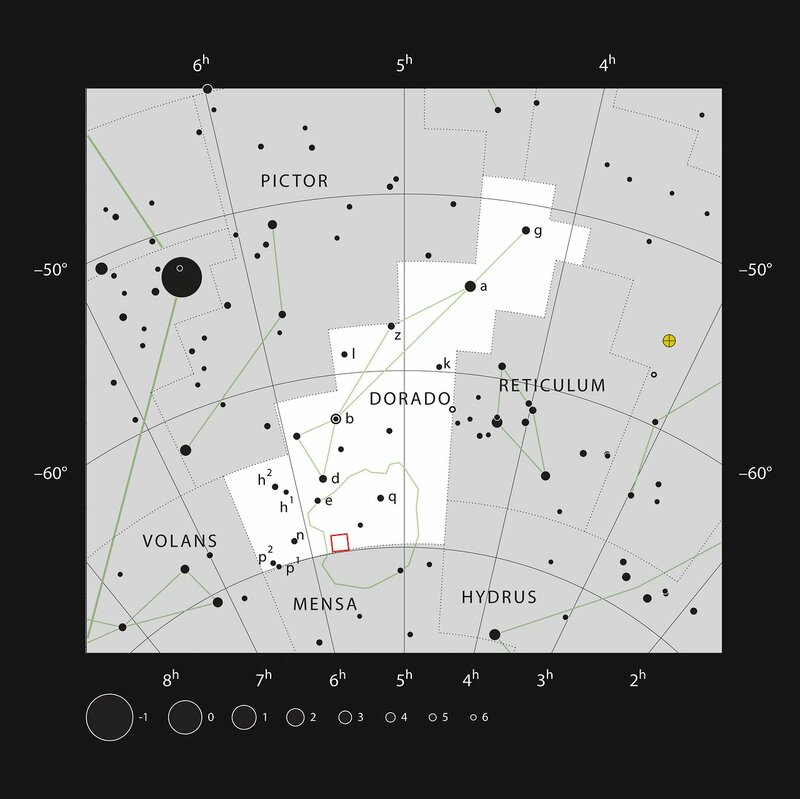 Another star cluster in the Tarantula Nebula is the much older Hodge 301, in which at least 40 stars are estimated to have exploded as supernovae, spreading gas throughout the region. One example of a supernova remnant is the superbubble SNR N157B, which encloses the open star cluster NGC 2060. This cluster was first observed by British astronomer John Herschel in 1836, using an 18.6-inch reflector telescope at the Cape of Good Hope in South Africa. 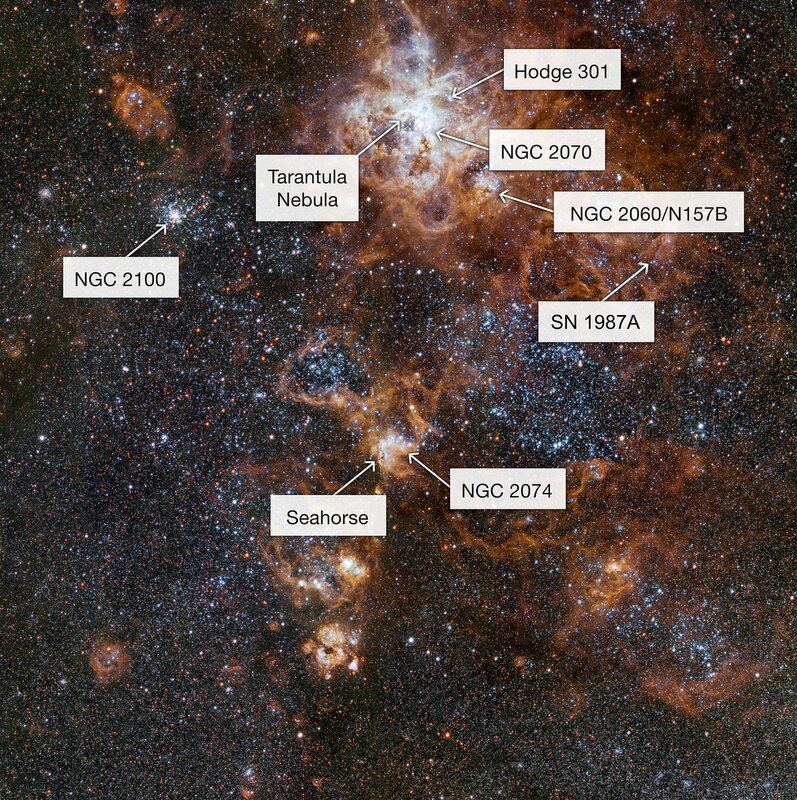 On the outskirts of the Tarantula Nebula, on the lower right-hand side, it is possible to identify the location of the famous supernova SN 1987A . Moving to the left-hand side of the Tarantula Nebula, one can see a bright open star cluster called NGC 2100, which displays a brilliant concentration of blue stars surrounded by red stars. This cluster was discovered by Scottish astronomer James Dunlop in 1826 while working in Australia, using his self-built 9-inch (23-cm) reflecting telescope. At the centre of the image is the star cluster and emission nebula NGC 2074, another massive star-forming region discovered by John Herschel. Taking a closer look one can spot a dark seahorse-shaped dust structure — the “Seahorse of the Large Magellanic Cloud”. This is a gigantic pillar structure roughly 20 light-years long — almost five times the distance between the Sun and the nearest star, Alpha Centauri. The structure is condemned to disappear over the next million years; as more stars in the cluster form, their light and winds will slowly blow away the dust pillars. Obtaining this image was only possible thanks to the VST’s specially designed 256-megapixel camera called OmegaCAM. The image was created from OmegaCAM images through four different coloured filters, including one designed to isolate the red glow of ionised hydrogen . SN 1987A was the first supernova to be observed with modern telescopes and the brightest since Kepler’s Star in 1604. SN 1987A was so intense that it blazed with the power of 100 million suns for several months following its discovery on 23 February 1987. The H-alpha emission line is a red spectral line created when the electron inside a hydrogen atom loses energy. This happens in hydrogen around hot young stars when the gas becomes ionised by the intense ultraviolet radiation and electrons subsequently recombine with protons to form atoms again. The ability of OmegaCAM to detect this line allows astronomers to characterise the physics of giant molecular clouds where new stars and planets form.